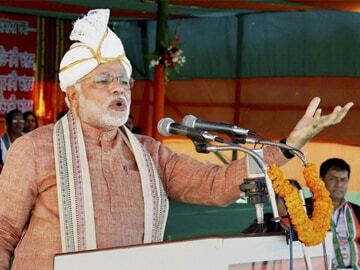 Narendra Modi addressing a public rally at Ramnagar in Assam on February 22, 2014. Silchar, Assam: BJP's prime ministerial candidate Narendra Modi today said Hindu migrants from Bangladesh must be accommodated in the country and detention camps would be done away with once his party comes to power. "As soon as we come to power at the Centre, detention camps housing Hindu migrants from Bangladesh will be done away with," Mr Modi told a public rally at Ramnagar in Assam. "We have a responsibility toward Hindus who are harassed and suffer in other countries. Where will they go? India is the only place for them. Our government cannot continue to harass them. We will have to accommodate them here," he said. Stating that this did not mean that Assam has to bear the entire burden, he said "it will be unfair on them and they will be settled across the country with facilities to begin a new life." Mr Modi alleged that the Assam government as a part of its vote bank politics had violated human rights of Hindu migrants in detention camps. Speaking on the issue of 'doubtful' voters, Mr Modi said this was also a part of the Congress' vote bank politics of denying a section of the people their right to vote. He urged the Election Commission to remove the tag of doubtful voters and give these people the right to vote to ensure free and fair polls. Mr Modi said that there were two kinds of people who came from Bangladesh to Assam; those brought as a part of a 'political conspiracy' for vote-bank politics of a particular party and others who were harassed in the neighbouring country. He said that those brought for vote bank politics and smugglers from Bangladesh should be pushed back, while the second category must find a place in the country. "Bangladesh is next to Assam, while Pakistan is next to Gujarat. Assam Bangladeshi se pareshan hai par pura Pakistan mujse pareshan hai (Assam is harassed by Bangladesh, whereas Pakistan is bothered by me)," the Gujarat Chief Minister said at his second meeting of the day in the North East. "You have to decide whether you will continue to tolerate Bangladeshi harassment or put an end to it. I have come to you for your answer. Trust me and as soon as we come to power we will take immediate steps to redress these problems and ensure that justice prevails," he said. Attacking the Congress, Mr Modi said that the 2014 Lok Sabha polls would mark the beginning of the end of the party. "After the elections, India will become Congress free and a new road of progress and development will be heralded. The nation has tolerated 60 years of waste and destruction but give me a chance for 60 months and I will translate your dreams and aspirations into reality," he said. Attacking Assam Chief Minister Tarun Gogoi, Mr Modi said "When your chief minister hears that I am coming to his state, he loses his sleep. He came to Silchar two days ago to remind you of the promises made by him before the last elections but has he fulfilled them?" He said Assam was bestowed with vast natural and human resources but still it was poor. "Who has looted and destroyed our Assam? Who has given those in power the license to loot?" Assam, he said, faced devastating floods in 2012. "Where was your chief minister then? He was in America and Japan and when asked about it, had said that he was studying flood management techniques in America. Can you build the future of the state and the youths with this kind of people?" Stating that the East-West Corridor was initiated during the prime ministership of Atal Bihari Vajpayee connecting Saurashtra in the west to Silchar in the east, he said, "Our work is done but it remains incomplete in this region. "Who is responsible for this? They have to answer the people because this is just not a mere road but a road to progress and development," he said. Mr Modi said that the railway broad gauge conversion in Assam also remained incomplete. Stating that the North East is 'our Lakshmi', he said "Where there is Lakshmi there is prosperity. We want both Lakshmi and Saraswati in the North East, but if Lakshmi comes where will she sit here? You know Lakshmi sits on the 'Kamal' (lotus) and to ensure wealth and prosperity, the lotus must be brought to power."